The Toshiba Satellite C55-C may not look like much, but she's got it where it counts, kid. The question you need to ask yourself with the Toshiba Satellite C55-C5240 is this: "If someone cobbled together performance car parts into a go-kart frame, would I drive it to work/school each day?" I'm torn on the Toshiba C55-C. More torn than I've felt about any other laptop in this class. It easily—and consistently—outperforms the competition, and does it for only $450. But all that power is packed inside one of the cheapest-feeling cases I've ever used. I am worried I will break the Toshiba C55-C in half. I know it's irrational—I know it's probably not quite that cheap a laptop. It's a real fear, though. Closed, the C55-C looks like a fine laptop—sleek black with a faux-brushed metal lid and understated Toshiba branding. It's not the ugliest laptop I've used by any means. It is, however, one of the flimsiest. Opening the C55-C feels like trying to open a bag of potato chips in a quiet classroom. Lifting from either corner of the lid causes the whole screen to flex and creak ominously, thanks to the fact the screen is essentially a half-inch of cheap plastic. Closing the lid is the same—grab a corner and you'll watch the screen literally bend before the hinges start to move. You could probably bend this screen into the shape of the St. Louis Gateway Arch with minimal effort, although I wouldn't recommend it. It'd probably violate your warranty. This is where Toshiba compromised, though. This cheap, flimsy plastic encasing the standard 15.6-inch 1366x768 screen. It's the one thing that drags down an otherwise remarkable laptop—or at least one that's remarkable in this price range. 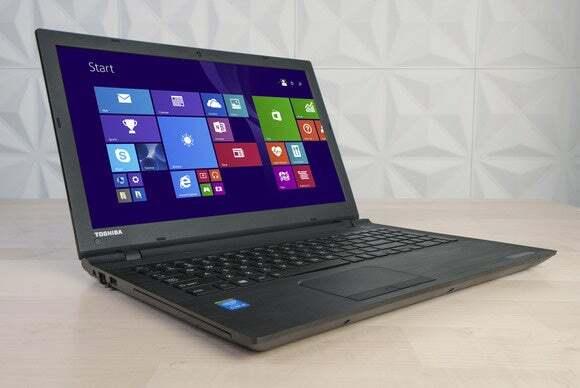 The Toshiba C55-C offers top performance in in a back-to-school laptop. Well, that and the mouse buttons, both of which are stiff and incredibly loud. The right mouse button's springy thunk noise quickly got on my nerves—and I'm someone who uses Cherry MX Blue keyboards at home, a.k.a. loud and clacky keys all day and night. These mouse buttons sound nearly as loud as an old IBM Model M buckling spring. Speaking of keyboards, the C55-C's is set almost flush with the case—a fancy Apple-esque effect that unfortunately isn't matched by the quality of the switches themselves. I didn't have any problems typing per se, hitting my standard words per minute/error numbers, but the keys themselves are a bit mushy and unsatisfying to type on for long stretches. That's a minor quibble though, and I'll take full-sized but mushy keys over clacky-but-small any day of the week. Nothing else especially stands out about the C55-C's design. The trackpad is a bit on the small size for a fifteen inch laptop, but not unusable. The sound quality is terrible, but that's on par with the rest of the laptops we looked at in this tier. The laptop is also surprisingly heavy, considering how flimsy it feels. Blame the HDD and optical drive, I guess—this thing comes in at semi-portable 4.8 pounds. 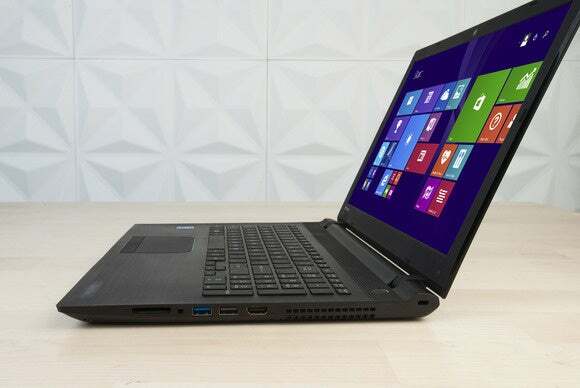 Let's get to where the Toshiba C55-C shines: performance. As I mentioned, the C55-C consistently outperformed every other laptop in this set of reviews. That's thanks in large part to the fact that it's packing a 2.2GHz Intel Core i5-5200U processor. The only other laptop to match that is the Acer Aspire E-15—but where the Acer only has 4GB of RAM, the C55-C has 8GB. The C55-C is the only laptop we looked at here with 8GB of RAM. And rounding out the internals, we've got the standard Intel HD 5500 integrated graphics and a 1TB 5,400 RPM hard drive. Not too shabby. The PCMark Creative and Work Conventional scores were closer calls, with the C55-C scoring 2,198 (to the Acer Aspire E-15's 2,055) and 2,771 (to the E-15's 2,669). In other words, the C55-C still edges out the competition but by an infinitesimally small amount. It's also worth noting that the C55-C has the best gaming performance of any of these laptops—though that's still not saying much. In the 3DMark Skydiver test the C55-C turned in a score of 2,791. By comparison, even a relatively underpowered gaming laptop like the 2014 Razer Blade Pro scored 11,586. You won't be playing any high-end games on the C55-C, though you could probably indulge in some less-demanding indie titles. The one bottleneck on the C55-C is its ponderously slow 5400 RPM hard drive. Even waiting for the C55-C to boot into Windows 8.1 is a boring proposition, and that feeling is sustained by CrystalDiskMark—the C55-C turned in the slowest scores of any laptop here, with a Read rate of 95MB/s and a Write rate of 99MB/s. And that's probably a best case scenario. This is no SSD. That likely also resulted in the E-15 scoring better on our Handbrake encode, wherein we transcode a 30GB MKV file. It took the C55-C seven minutes longer (2 hours and 29 minutes) to transcode than the E-15 (2 hours and 22 minutes), even though the C55-C outclassed the E-15 handily in other tests. I will say this about the C55-C: At least it's not too full of garbage software. In fact, the worst thing on this laptop is probably the thing designed to keep you safe—my old buddy McAfee. I rate McAfee as one of my least favorite antivirus programs, but you're free to run what you wish. As for other third parties, we've got Skype WiFi, CyberLink PowerDVD, FreshPaint, and the iHeartRadio app. The biggest offender here is actually Toshiba itself, which has crammed this laptop full of all sorts of Toshiba-branded utilities you'll probably never use—Toshiba Application Installer, Toshiba Audio Enhancement, Toshiba Display Utility, Toshiba Password Utility, Toshiba Recovery Media Creator, and the list goes on. While these could be helpful if you're a computer novice, there are plenty of other (better) programs that do the same things, many with smaller footprints. But still, the C55-C is actually pretty decent as far as budget laptop bloatware goes—there's really not a ton of useless stuff here, and all of it seems safe. The Toshiba C55-C isn't flashy or glamorous, but it gets the job done—and does it better than any of the competition. If you're looking for a fast laptop in the sub-$500 range and don't give a damn how it looks, this is your ticket. The C55-C is a straight-up bargain considering some of these benchmark scores, and it would fare even better if you have the technical know-how to swap in an SSD. But those who are a bit more style-conscious might be better off checking out the Dell Inspiron 15 5000 or HP 15t Touch—close runners-up in the PCMark tests, they also look and feel quite a bit less cheap than the C55-C.
By compromising on build quality, Toshiba managed to pack the performance of a $600 or $700 laptop into the much cheaper C55-C5240.